Often misunderstood, largely ignored, mushrooms are like Ann from Arrested Development–reluctantly included, and rarely the object of attention. We can talk all we want about healthy diets, superfoods, natural vs. organic, and the like, but there’s no debating the health benefits of mushrooms. They’ve been studied exhaustively, and the verdict is in: they’re good for us. Period. Why, then, are they so forgotten? As a society, are we a bunch of fungiphobes? Do the psychoactive varieties get too much of the spotlight? Do too many people still believe all commercial mushrooms are grown in manure (they’re not)? I went to the Telluride Mushroom Festival in August. There, I learned how to identify a few edible mushrooms. I learned that fungi and animals are closer kingdom relatives than fungi and plants. I learned that certain mushrooms can be converted into fabric and building material. And I learned how to cook chanterelles and porcinis to perfection. Perhaps the most intriguing thing I learned, however, involved mushrooms’ role in the immune system. Mushrooms such as reishi, chaga and shiitake regulate and balance the immune system1. People with autoimmune disease, whose immune systems are overactive, could therefore benefit from taking medicinal mushrooms. It’s truly a shame that fungi are so ignored in Western cultures. We’re all convinced we’re going to die if we eat anything from the forest (“What do the berries taste like, Ralph?”). But Eastern cultures, such as Japan and China, have used mushrooms therapeutically for thousands of years. Eastern Europeans and Russians go on regular forays. They come back with baskets full of edible mushrooms. Look around the bases of trees and the edges of the forest, where there’s a good combination of rain and sun. Specific mushrooms and trees also have symbiotic relationships, so looking for oaks, for example, could lead you to a patch of chanterelles. For the novice mushroom hunter, it’s best to avoid gilled mushrooms. If you pick the mushroom, discard the stem, and inspect under the cap, you shouldn’t see any gills. Caution: no gills does not always equal edible. Avoid the LBMs (Little Brown Mushrooms). Many are poisonous. Most will not yield a full dinner anyway. Better skip ’em. 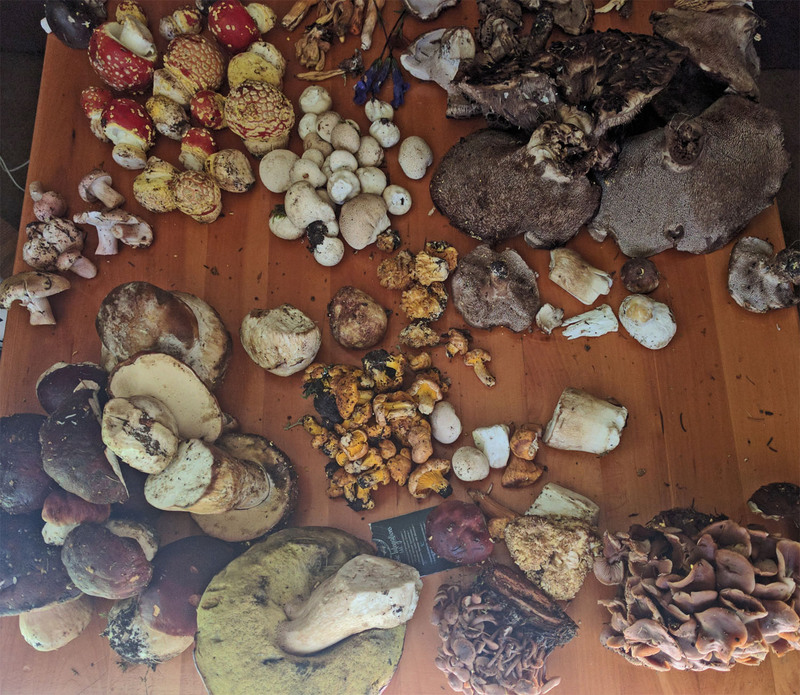 Familiarize yourself with the characteristics of a few edible mushrooms (and their poisonous lookalikes, if any), then scour the forest for those few. There are countless species of fungi out there, and memorizing them all is a task best left to mycologists. Start simple. Bring a knife and basket and/or tackle box to collect the mushrooms. Wax paper bags are also helpful in keeping different specimens separate from one another until you get home to identify them. 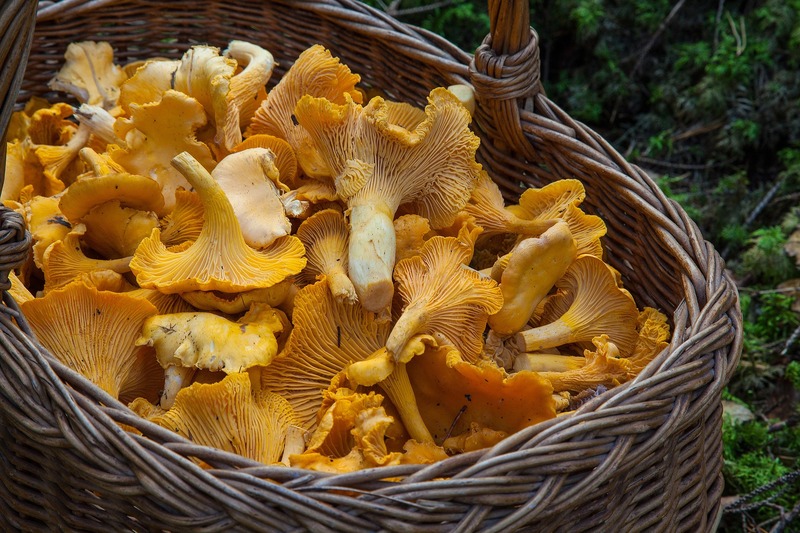 There’s something magical about foraging for food, and mushroom hunting is such a useful and enjoyable pastime. I’ve been trying to eat more mushrooms since attending the festival. I hope you will after reading this post, too. 1 “Antiinflammatory and Immunomodulating Properties of Fungal Metabolites.” Cristina Lull, Harry J. Wichers, and Huub F. J. Savelkoul. Mediators Inflamm. 2005 Jun 9; 2005(2): 63–80. http://www.ncbi.nlm.nih.gov/pmc/articles/PMC1160565. Not the best photo, but here’s what 5 people scrounged up in 2 hours in the mountains around Telluride. Not bad.